I have Zee Cinema to thank for renewed acquaintance with many cherished classics from my misspent childhood – such as The Burning Train, which used to be my favourite non-Amitabh film as a seven-year-old (in fact it’s still my favourite non-Amitabh film as a seven-year-old). Dharam paaji and Vinod Khanna are childhood buddies who serenade Hema Malini and Parveen Babi by cycling after them and singing one of the most instantly forgettable songs of the 1980s (I forget what it was called). This comes on the heels of an elaborate gag where each one pretends to eve-tease the other guy’s girl so that each of them gets to play hero in turn; these shenanigans will provide useful practice for the scenes much later in the film when they have to clamber about the side of the train dressed in smart silver-foil outfits (fuzzy pic below), fighting Danny Denzongpa. After much coquettish wiggling of noses by the ladies, the two couples settle into happy domesticity and produce a brood of younglings, played by intolerable child actors who make horrible ululating sounds whenever they have to cry (making the viewer want to smack them on the head so they might do some impromptu Method acting instead). The plot of this movie, set a few years after the cycle-serenade episode, ensures there will be plenty for them to cry about. The best thing about The Burning Train is that the title isn’t an obscure metaphor-ish thingie, as in those movies made by Bresson and suchlike – the film really is about a burning train, or more accurately, a train that is burning. There’s plenty of (intended) metaphor in the story though, with the imperiled chook-chook and its disparate passengers representing the Many Colours of India. Clad in elegant white (a terrifying portent of things to come on satellite television 20 years later) is Simi Garewal as a Catholic schoolteacher escorting a tribe of wailing little monsters. There’s a Hindu priest and a Muslim maulvi who initially squabble but later, faced with certain Death, smile sadly at each other and agree that when you’re being roasted alive in an unstoppable moving oven, religion suddenly doesn’t seem so hot. A loud-voiced but genial Sardarji rounds off this touching panorama. (He will volunteer to unravel his turban later for the Greater Good, just as a lady passenger will remove her sari.) There’s even a pregnant woman, though surprisingly her presence doesn’t lead to any of the “kindly give berth” variety of jokes that I would certainly have incorporated into the script. Best of all there’s Jeetendra, who shows up halfway through the movie and, without prelude, performs an elaborate dance with Neetu Singh, for once dressed in something other than her favourite fisherwoman outfit (regardless of what she’s playing). 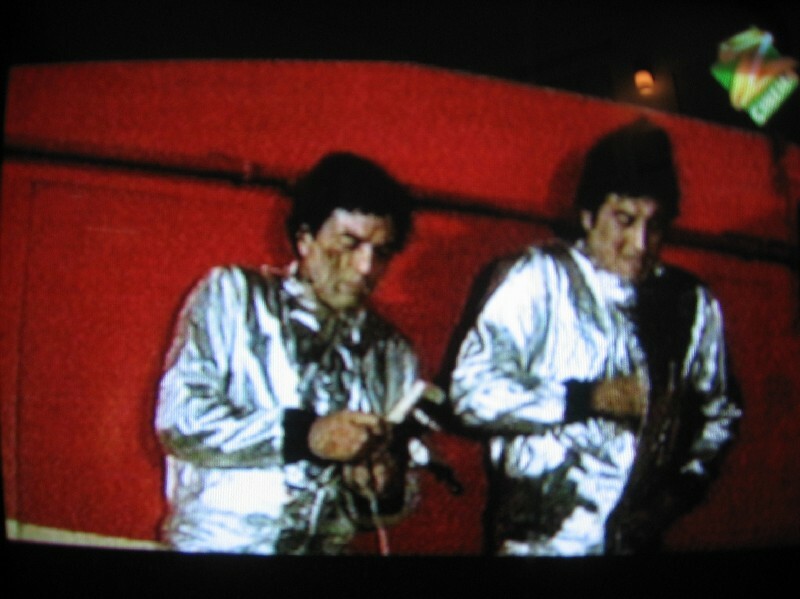 When the train starts to burn, Jeetu teams up with Dharam and Veenu and they all change into those silver-foil costumes that people in sci-fi films wear to prevent alien beings from sucking out their mojo. Jeetu’s white shoes go very well with the foil outfit, and Dharam and Veenu are envious – but they put these differences aside to save the train by doing a series of complicated things (which even they don’t fully understand) in the boiler room, and by kicking Danny off the roof. There is much cheering as Hindus, Sikhs and Muslims embrace: the crisis has united them and never again will there be riots or race-killings. Hema looks appreciatively at Dharam’s silver-foil suit as he gets off the train. “This film is dedicated to the courage of the people, and the soul of India which has remained uncorrupted” says a closing credit. Audiences were courageous enough to stay away from theatres in droves, and The Burning Train was an uncorrupted flop. Well... to be honest, I liked the movie. I still watch it whenever I come across it on TV. Conman: I love the film too! I think you guys too have this secret liking for trains. I used to watch this movie whenever it came on too! There are a huge number of mistakes in the movie from the railway operational point of view. But that doesn't seem to have deterred the producers. The movie was made with a lot of assistance from IR anyway. In case you want to see pics, videos and huge amounts of info about Indian trains, go to www.irfca.org. Don't be surprised if you end up becoming addicted. Join the mailing list and search the message archives for more info on the movie. I bet you will be amused. Apologies for the anonymous posting. Uh... that didn't really turn out anonymous, did it? Well this one is ;-). Interesting movie...it had children aspiring to be engineers in the Railways, i think it would be a rather weird career choice for students now. 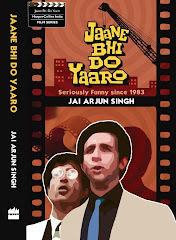 It was one of the few Hindi films on a videocassere( kids remember the VCR...! )which we had in Africa. I have seen the films around 10 times! Jai it also had the "whore with the golden heart" charcter played by Asha Sachdev. The maulavi and the priest keep hitting on her..I guess the director wanted to show that lust is secular.Also Hema leaves Dharam paaji in the movie because she looses a leg in an accident-"main tumpe bojh nahin banna chahti" dialogue follows..I wonder if these kinds of characters will be written about today.. Hilarious post, starting from "Turning Brain"(Are you a Laughter challenge fan too? )Vaise this movie vindicated my "theory" that Big B ek taraf and the rest of the heroes ek taraf. "Clad in elegant white (a terrifying portent of things to come on satellite television 20 years later) is Simi Garewal." --Ha, ha, well said, bro! Did you know the horror show is back? I am waiting for the day when an interviewee will get fed up of the oh-so-prim-and-propah routine and do something really subversive, like jumping up and down on the sofa or leaning over and making faces at her or something! Anonymous: We guys have a "secret liking for trains"? Really? Me and who else? Anonymous 2: yes, the goldenhearted whore gets to remove the sari. Lak: Big B is ek taraf alright but I have to say a film that has both Dharam paaji and Parveen Babi (very short role, alas!) in it is quite a heavyweight in its own right. Mayank: yes, a script with Abhishek Bachchan packing his jhola and running off to the big city to become a railway engineer would definitely lack dramatic tension. Tridib: Maybe she should invite Cyrus Broacha over sometime! Hasn't she worn white all her life? I mean pre-Burning Train days as well. Wonder if she thought of herself as a wannabe Nargis. I have a teeny-weeny crush on the young Vinod Khanna, so any early movie with him, I'd definitely watch again. Hilarious. Wonder why she has that white fetish. Ya, she should call Cyrus Broacha. Hmmm...have no clue what you're talking about but love the title :-). Or was the title inspired by the Bob Dylan Album/Song "Slow Train Coming"? Sumptuously hilarious. As usual you are at your cheeky best, Jai. I am yet to decide which one is better – “the two couples settle into happy domesticity and produce a brood of younglings, played by intolerable child actors who make horrible ululating sounds whenever they have to cry (making the viewer want to smack them on the head so they might do some impromptu Method acting instead)” or “There’s a Hindu priest and a Muslim maulvi who initially squabble but later, faced with certain Death, smile sadly at each other and agree that when you’re being roasted alive in an unstoppable moving oven, religion suddenly doesn’t seem so hot.” Both had me in splits. Aha,fine way to start a day of much work;-)Merci Beaucoup! This was a funny scene where Gufi Paintal (I think) wants to go to the toilet desparately, but finds it locked. He waits for the person to come out and out comes Paintal. He is about to go in, when out comes Keshto as well :-) He is dumbstruck for a little while, and at that momemt a small kid goes quietly past him and enters the toilet. Lol Arjun...that was a real good one. Good job with the title....Slow brain turning....great twist..
btw, are you Sikh? No offense but I recall an article in the Indian express by a young sikh journalist(you name sounds similar thought I dont recall his name exactly) about the 1984 anti Sikh riots. The article was beautifully done and gave me a human perspective to those times. Just wondering if you the same guy. Very funny review. Thanks for not saying anything about the songs. The lyrics were by Sahir and the music was by great RD. The song which was picturized on Dharam paaji and Vinod Khanna cycling was `pehli nazar main hum ne to dil de diya tha thumko, pur tumne daer lagaye, ruk ruk ke baat bhadhayee'. Ken: ya, I had the Dylan album in mind - don't usually like mixing puns but couldn't resist this once. Swati: Interesting possibilities in the "wannabe Nargis" thing, given her (supposed) Raj Kapoor obsession. Anonymous (toilet comment): hmm, wonder why the small kid didn't get a mention in the credit list. Confused: No, that wasn't me. I do have vivid memories of 1984 though, and mentioned some of them in passing in a review I wrote of the film Amu - should be on this blog somewhere. "Clad in elegant white (a terrifying portent of things to come on satellite television 20 years later) is Simi Garewal..."
I guess I'm repeating what others have said, but this phrase alone made me laugh so much...I'm getting some strange looks as I giggle away at the computer. I love the movie and still watch it everytime it comes arnd..
absolutely lovely movie. And Dharam paji's balidan, omg. There was ever gentlemanly Naveen Nischol too in a role which I used to call 'side-ka-pappu' whose dharma is to woo the heroine but not too much so that at the end he gets back to hero.